PubMed, the National Library of Medicine’s premier database for biomedical information, has unveiled a new search interface. Although PubMed searching is free to the public, Villanova University users should always access the database by starting at the Falvey homepage, clicking Databases A-Z and then choosing PubMed. This will allow you to link to full text articles included in the library’s online journal subscriptions. The following YouTube videos will introduce you to PubMed’s new look and help you locate some of your old favorite search features. 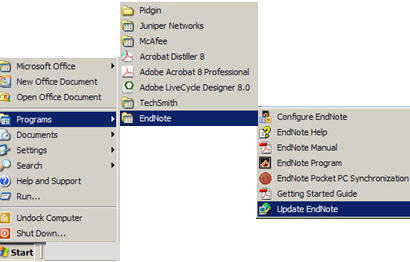 EndNote recently released version X3.0.1 for Windows, incorporating the APA 6th into its output styles. If you already have version X3 installed on your PC or laptop, you can download the update by clicking Start –> Programs –> EndNote –> Update EndNote. NOTE: Download will work on campus only! If you wish to install the program on an off campus computer, please borrow the CD available at the Falvey front desk. Version X3 for Mac is also available at https://library.villanova.edu/Help/FAQs/EndNote or on CD at Falvey front desk. How do I obtain the updated Endnotes with the APA 6th ed format if I am off campus and cannot borrow a CD from the Falvey Library?